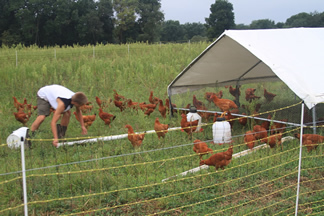 We sell delicious, healthful, pastured chicken, pastured pork, pastured eggs, and 100% grass-fed beef all raised on our certified organic pastures. 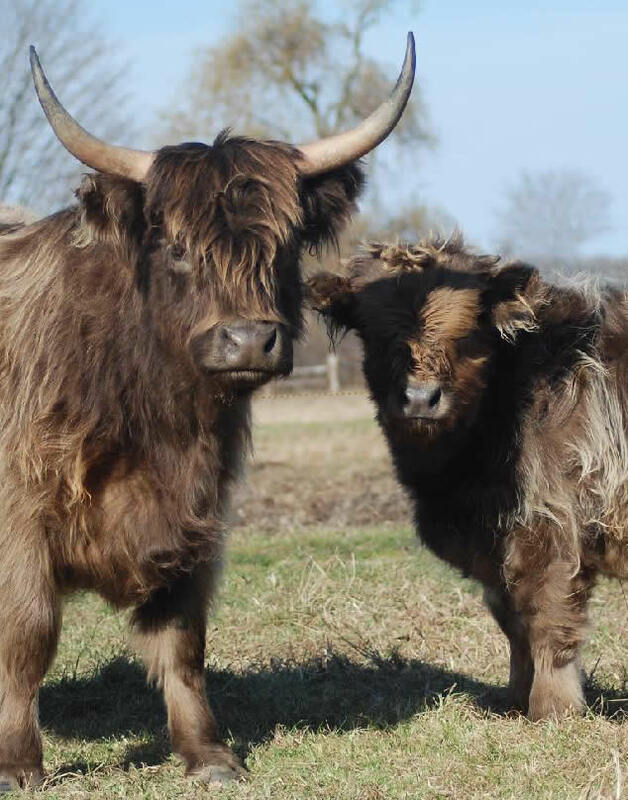 Our cattle are the foundation of our holistic farming system that mimics nature in a way that builds fertility in the soil, treats the animals humanely, and produces healthy food. In the spring, summer, and fall we move our cattle every day to graze in a fresh paddock of our certified organic pasture. The cattle trample what they don’t eat, leaving behind plenty of organic material to feed earthworms and other organisms and to return nutrients to the soil. We provide free-choice certified organic minerals such as salt, iodine, potassium and calcium. During the winter, we feed them certified organic dry hay and wrapped bales of certified organic high-moisture hay. We do not treat our cattle with hormones or antibiotics. Our cattle have never tasted corn, corn silage, brewer’s grain, or any other kind of concentrated grain. We do not even use grain for “handling” them. We buy weaned calves only from like-minded farmers whom we know and trust, and we require our suppliers to agree to our “never-ever” protocol. Compared with the corn-fed or grain-fed meat you find in the supermarket, our grass-fed beef has less total fat, saturated fat, cholesterol, and calories. It also has more vitamin E, beta-carotene, vitamin C, and a number of health-promoting fats, including omega-3 fatty acids and “conjugated linoleic acid,” or CLA. Our beef contains no added hormones or antibiotics. Free from the unhealthy confinement and the unnatural diet of the industrial feedlot system, our grass-fed animals live low-stress lives and are so healthy, there is no reason to treat them with antibiotics or other drugs. Instead of a farmer tilling the soil, planting corn, harvesting it, and feeding it to the cattle, our cattle harvest their own food: pasture. This minimizes the use of non-renewable energy, minimizes erosion, and builds rather than depletes soil fertility. We use no synthetic chemical fertilizers, pesticides or soil amendments. Our Chickens live out on the same pasture as the cattle. We buy them as day-old chicks, and care for them in a brooding house for their first three weeks. In the brooding house, they are sheltered from the weather and from predators, and we feed them only certified organic feed with no antibiotics and no hormones. 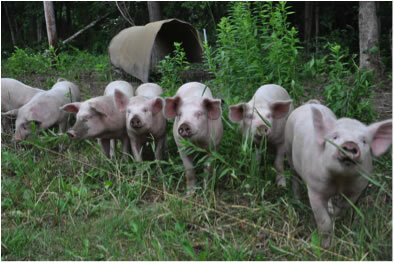 At three weeks, we put them out into our certified organic pasture, where they spend their days chasing after bugs and eating green plants as well as the certified organic feed we give them. The resulting meat chicken is incredibly delicious and good for you, and their days out on the pasture give back a bounty of fertilizer for our soil. Our laying flock spends the summer in a movable house out on the pasture, much like the broilers. However, the laying house has nesting boxes and roosts, where the laying hens spend the night. Our layers are full-grown birds that can fend for themselves during the day, so they don’t need the protection of a movable electric fence. At night they come in the house to roost, and we close the door to protect them from predators. Every morning at dawn, we open the door, and they come out for their breakfast. They get so much of their nutrition from the insects they find and from green grass, their eggs are much more nutritious and delicious than typical supermarket eggs. You can even SEE the difference in the bright orange color of the yolks! Steve Normanton has been farming since the age of eight. He grew up in South Africa, where he learned the livestock trade from his mentor, Ian Blackwood. Steve worked throughout his school years in Ian’s 16,000 acre operation raising antelope, giraffe, rhinocerous, buffalo and other African game in addition to cattle. 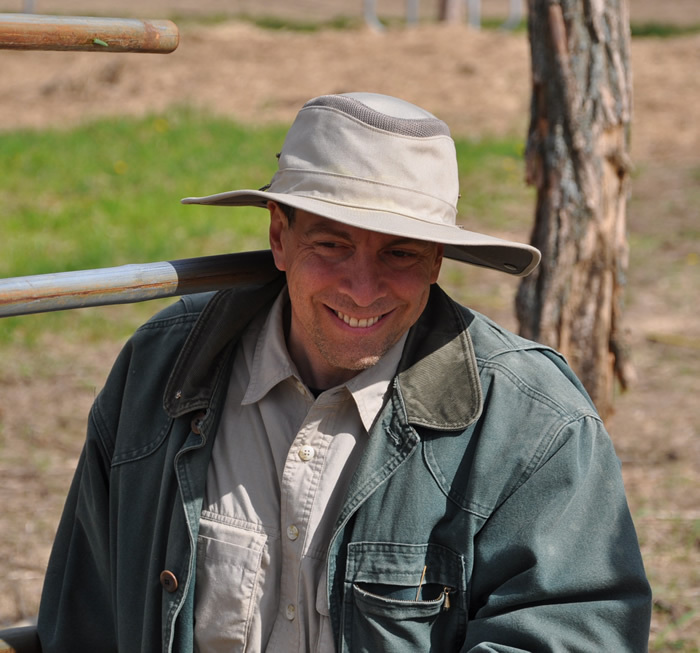 After serving his country in the military and a stint in agricultural college, Steve quickly climbed the agribusiness ladder, ending up as a Farm Manager for the Mentz Brothers. The Mentz Brothers operation grew from 8,000 acres to 34,000 acres during Steve’s two-year tenure there, with a 200 cow dairy, a 120 sow pig-breeding unit, and a 500-head beef operation, plus corn and peanuts, and a butchering facility. After that, an extended walkabout (including a year of safari guiding) led Steve around the world and eventually to the U.S., where he married and settled. While working as a carpenter to support himself and his new family, Steve immediately scraped together some cattle, grazed them on borrowed land, and searched for an opportunity to establish himself as a full-time farmer on his own place. Omar Khudari is a retired computer software entrepreneur. Since starting his first company in 1987 and selling it in 1995, Omar has helped start over 20 companies as an investor, board member, and advisor. In 2008, Omar’s interest in sustainable agriculture and a healthier alternative to feedlot beef led him to Steve Normanton—first as a customer and then as a business partner.